Beethoven, Ludwig van, 1770-1827. Fidelio (1806). Ouverture (Album leaf). 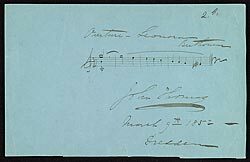 Overture to Beethoven's Fidelio (album leaf) : manuscript in the hand of John Thomas, 1852 Mar. 9.